This is the 1996 2nd pressing of this album, on Rob Darken's very own (short lived) Isengard Distribution - just as hard to get hold of as the original Lethal records pressing. Later re-issues have a colour cover, ironically on 'No Colours' Records. Out of all of Graveland's releases, this is always the one that gets picked first when throwing some on my stereo. Rob Darken's highly productive musical vehicle has spawned well over 20 different releases over the last 15 years or so, and although I personally still have more of an affinity for his earlier morbid black metal sound, their take on Viking metal isn't to be sniffed at either. 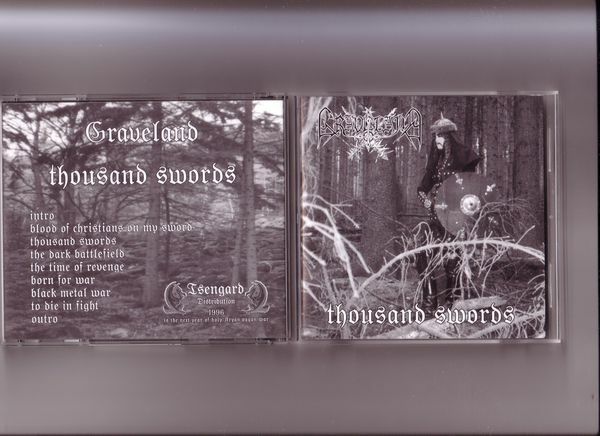 'Thousand Swords' saw Graveland take the first step towards their more pagan approach to songwriting of their later releases, moving away from their early Emperor/Bathory sound of their demos and debut album around 1995 (not counting 1996's re-release of their 'In the Glare of Burning Churches' demo, which originally was released in 1993). Even though there's quite a few black metal riffs thrown into the mix, Capricornus's drumwork gives a galloping feel to the album as a whole, which alongside the occasional usage of tambourine and Viking horn, adds a different dimension to the average black metal sound. With the anthemic opening intro, it immediately gave birth to a new era in the Graveland ranks with a medieval, war-mongering feel which only grows stronger as the album progresses. A lot of the riffs have a very folksy feel to them, sweeping and echoing with a gleeful uplifting tunefulness, and although there's not much power in the guitar sound, it simply adds to the primitive feeling of the release. Vocally, Darken uses a throaty croak which reverberates over the peaking riffs like fleeting snowdrifts flowing their icy powder over mountainsides, which when coupled with his lyrical topics (based strictly around the destruction of Christians and all that they stand for) only adds to the sub-zero feeling of the album. Whilst Graveland were to go on to become a more professional unit than they are here, you can really feel the Pagan spirit in this release. Even with all its little idiosyncrasies (and at times clumsy sound) it contains that extra je ne sais quoi that a lot of later Graveland hasn't quite managed to replicate as yet. A fantastic release from a top quality band.